You've decided to start using a Lights Spreadsheet? Good choice. 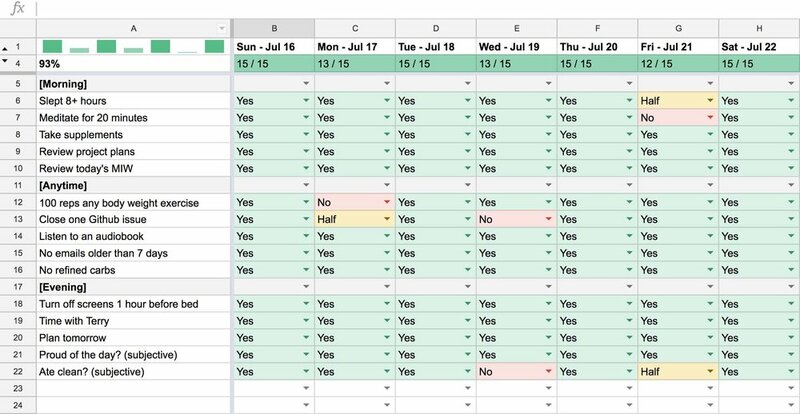 A Lights Spreadsheet is a powerful tool to help ensure your most important habits happen every single day. Your Lights Spreadsheet idea has been one of the most useful things I have done in my life. I've been running on it uninterruptedly for exactly two years this month and it's helped/helping me build better habits, drop bad ones and track how other things in my life are going. If you'll enter your email below, we'll send you our very best practices as well as a powerful, customizable template that you can start using today.